January and February are always transition months-- into the new year as well as a new semester, schedule, and group of students. Lots of both personal and professional updates all mixed together. Here we go! This spring semester I have 74 students between four classes. I am teaching two sections of College Writing I. One section meets twice a week, and the other meets just on Monday nights. I like the diversity between the courses, and both sets of students are attentive and strong. I am also teaching Business Communication and Technical Writing, which I taught in the fall as well. I really enjoy that class. There is a lot of hands on work time, group work, and live audiences responding to the student's work. I think especially for professional writing classes that last element is really important. I am also teaching Writing Fiction and Poetry for the first time. With a class of six students I am working towards a discussion based class where students can share, work, ideas, and misgivings. We've had a strange start to the semester with snow, ice, and wind days, but as we wrap up the fifth week of the semester I feel like we are going to move into the latter two thirds strong. 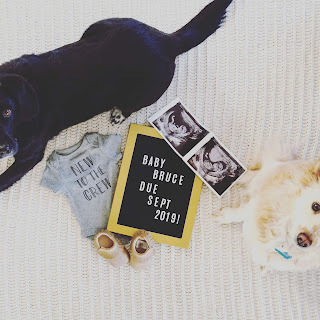 We had an eventful end to last year, including winning the baking contest I mentioned in my December post. Out of a friendly, intense competition of four, we came out on top. And our bake was gluten free! Got to spend good time with cousins and friends, though my lovely 88 year old Nana ended up in the hospital after all the Christmas excitement. Glad to report that she is finally back home and starting to heal. The beginning of the year was also one for the record books! I helped host a women's event to celebrate the new year with our Ridgeway Bloom Women's Group. We had a great turn out, delicious breakfast food, and really fun activities. A week or so later Wade told me he was taking me out for dinner one night to celebrate my birthday, but it turns out he had a whole surprise party planned! It was a wonderful night of feeling so celebrated by my friends, eating lovely snacks my sister put out, and playing games together. It was a "Black and White" theme, and I loved it. I started the semester here at Olivet in mid-January. I taught my first week of classes, packed up and boarded a plane headed to Bangkok, Thailand! My husband and I spent ten days in Thailand to start out 2019. We spent about three days in Bangkok total, exploring the markets, getting foot massages, and looking over the river. The majority of the trip we spent in Sukhothai, Thailand at Boon Lott's Elephant Sanctuary. Hung out with the two employees, six kiddos, one volunteer, other three guests, 12 elephants, at least six dogs, multiple mahouts, and a host of other rescued animals including a horse named Teddy. We spent our days walking with the elephants, helping take care of dogs, eating delicious Thai food, cutting down corn or banana trees, and watching the sun set over a bonfire or water reservoir. I celebrated my 30th birthday there, and I fell in love with sweet old elephant Pang Fai. It was truly a magical, once in a lifetime experience. This semester a few exciting things are coming up. One is the 2019 Conference on College Composition and Communication. It is being hosted in Pittsburgh this year, and I am excited to host help host a workshop and present on a panel. 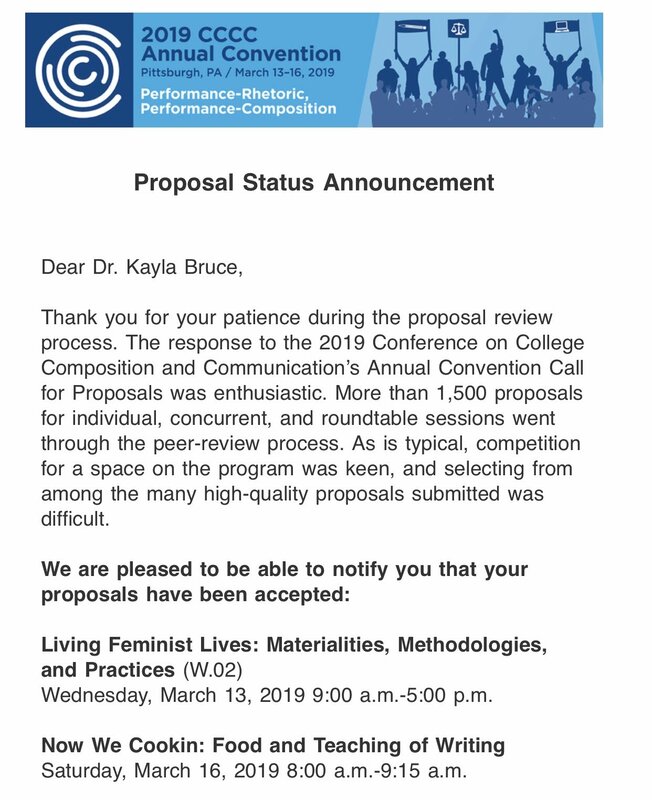 I also received news of an article publication acceptance, and I submitted a proposal for a food symposium this summer and for a panel proposal for Fem/Rhet 2019 with my writing group for the fall. I enjoy these professional development opportunities and chances to connect with people. December is here! For better or worse, we've made it to the end of the year. I remember thinking that 2017 was tumultuous, but I guess it was just a warm up for 2018. Some really wonderful things have happened, like I got to start my first full time job after earning my Ph.D., but there have been some heartbreaks as well. Glad to have made it to this point. I'm ready to celebrate Christmas and welcome in 2019. Below is the image we used for our family Christmas card. Merry Christmas! I finished my grading today! Grades for all 82 students went into the final grade book. It always feels slightly unnerving to submit grades at the end of the semester-- so final! But I do feel good to officially have the fall semester behind me, as well as the spring semester to look forward to. For final projects my students submitted a variety of work. In my Business & Technical Writing course the students submitted final portfolios, as well as did presentations on the practicum work they had done over the semester. In my Advanced Writing course my students also submitted portfolios and presented on their writing identities. I appreciated their introspection and willingness to share. I really appreciated this comment because this student wasn't trying to earn a better grade or future approval. She just wanted to let me know this before the end of their time at Olivet, and I really appreciated it. It's comments and reflections like that that inspire me to keep working hard and appreciating my job. Outside of the classroom I've attended five of ten holiday parties/events/gatherings for the year. So far, I've enjoyed them all. One of my favorite parts of the Christmas season is the baking and food preparation! I've done a gluten free vanilla noel cake, a cheese and cracker Christmas tree board, and gluten free cookies: strawberry thumbprint and chocolate ginger. This week has been particularly festive. On the last day of finals Wade came down to IL, and we went to see John Legend in Chicago! If attending his concert isn't the highlight of my Christmas season I will be surprised. We saw A Legendary Christmas Tour at the Lyric Opera of Chicago. It was a chilly, rainy night, but John Legend's singing was warm and rich-- I think like what butter would sound like. It was a wonderful night, and he sang both Christmas songs and a lot of his classics. This upcoming week we will attend Wade's holiday party and bring our gluten free version of Mary Berry's Bakewell Tart recipe for a tart competition (first attempt posted below). Here's hoping! My extended family will come into town this weekend and next week, and we will celebrate the holiday together. The new year will bring both a fresh start of a new semester as well as a trip abroad. For those reasons, I will plan to post my next blog mid February with an update on all stated events! 1) I've loved the fall weather but now we are already into winter! The turning of the leaves, the freshness of the air, the first snowfall-- it all feels so magical. 2) I got the opportunity to help lead our annual fall women's retreat through Ridgeway Church. This year, we called it Bloom: Change Begins With Her. We had close to 50 women in attendance, and we got to host them and really enjoyed spending time together. 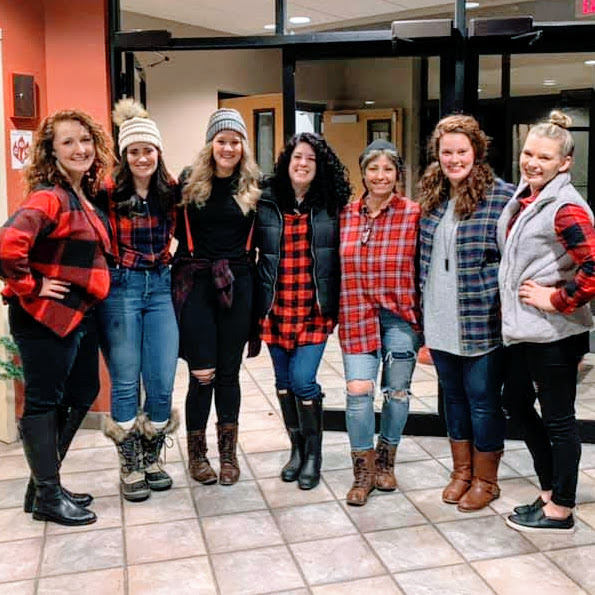 We all were challenged to make change in our community by Marelene Sorenson, one of the founders of Zeteo Community Inc, a local organization working to fight human trafficking in Madison and provide support for women and children who are survivors of trafficking. 3) I also had the chance to go back to my MA alma mater, Illinois State University, at the beginning of this month. The current WPA, Dr. Joyce Walker, invited me and other past graduate students to come back for a one day retrospective event to talk about how we are using, adapting, and implementing the theory of Pedagogical Cultural Historical Activity Theory in our classrooms. My friend Laurenn York and I presented on the Initial Genre Assessment that we first developed while at ISU and that we both continue to use at our respective institutions. It's always really invigorating to attend these professional events, to see old colleagues and friends, and to hear about the interesting and innovative work that they are doing. 4) Work at Olivet has been busy and exciting! Two of my colleagues attended the PCHAT retrospective with me, so we've been having really cool conversations about the potential for our freshman writing program. I have been asked to lead a committee dedicated to reviewing that work and proposing pedagogical and theoretical shifts in our courses. I currently have a course load teaching about 83 students, which is a lot and definitely keeps me on my toes. I gave extra credit for students who dressed up for class on and around Halloween, and there were some great costumes! It made it really fun to go to class the week of Halloween. 5) On the home front, my husband and I have sold our home, so we are in the process of moving out all of our things and settling into a new (albeit, temporary) space. I miss my family when I'm away at work, but I'm looking forward to the upcoming breaks to get to see my husband every day and spend more time with my adorable pups. We've loved our home and are sad to leave it, but I am happy to know that a new family will now get to make memories there. This blog post is my 50TH POST! Thanks for reading and for your support. 1) I get two extra nights at home that I wouldn't usually get with my commute. 2) A week from today I will be helping to host our 2018 Bloom Women's Retreat. Our theme this year is "Change Begins With Her," and I'm so excited about what the weekend will look like. I will talk about the retreat in November, but I want to cover my first six weeks as an Assistant Professor in the Fall 2018 semester at Olivet. The first six weeks have been, in turns, a total blur, a dumpster fire, a smooth sea, a confusing maze, and an unexpected surprise. That is, to say, it has been an adjustment for sure, but it's gone well. My commute from Madison is definitely one reality that I've had to adjust to. I generally leave my house in the wee early morning hours on a Monday, and then I do the reverse drive on late Thursday evening. I work from home (and get appointments done, etc.) on Fridays. I am staying less than a half mile from my office. I have walked a few times, and it takes me about 10 minutes from the door of my house to the door of my office, and that includes a walk across a busy intersection and walking up four steep flights of stairs. I have one long commute and then literally no commute after, so it works out. 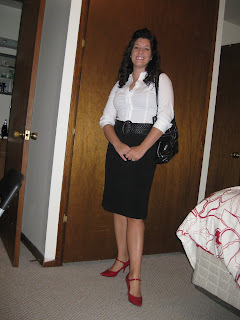 I was excited to jump into teaching at Olivet. As I've recounted a few times now, I feel like a totally different person, and I'm for sure a totally different teacher than I was when I adjuncted two ENGL 109: College Writing I classes in the fall 2011 and spring 2012 school year. Life was very different. 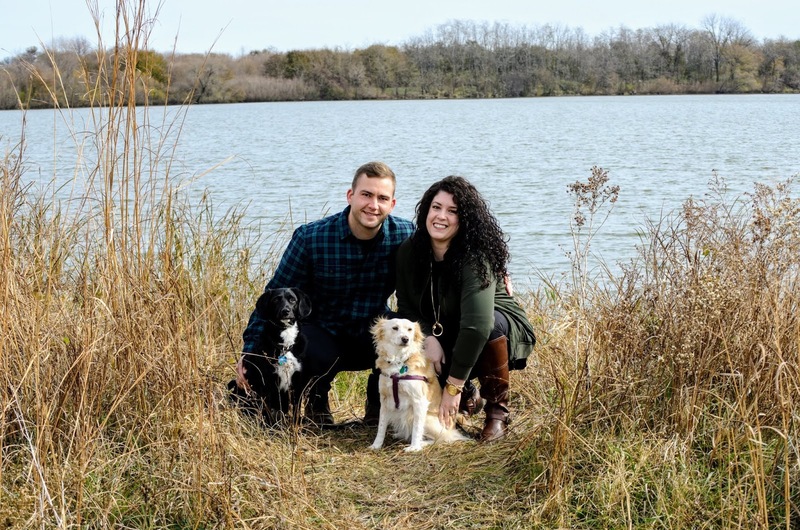 I had just graduated with my BA in English, Wade was finishing school, we'd just gotten married, we adopted our puppy, Finley, and we were living in a 600 sq. ft. guest house. One thing that is the same is that on the first day of school this year I wore the exact same red shoes I wore on the first day in 2011. I got those red shoes in college, I think, and I still love them. They're my first day shoes! One of my favorite parts of the new gig is my office. Wade helped me get it all set up, and with a mix of Harry Potter, travel, and elephant themed decor, it feels homey and cozy to me. I like to come in, turn on my lamp, wax melter, and AC fan to get some soft light, smell, and air moving through the office as soon as I get in. It's a sweet little nook that looks out at a lovely Catholic church and over a large tree that is currently turning from green to red as we move into autumn. I've enjoyed my classes thus far! This semester I have 84 students. That's far more students than I've ever had before. I teach these 84 students in four different courses: ENGL 109: College Writing I (two sections), ENGL 306: Advanced Writing, and ENGL 311: Business Communication & Technical Writing. I do have two teaching assistants through the English department, and they are wonderful. I could not get the grading done that I would need to without them. My students are currently working on academic proposals, documenting online processes, and reviewing food TV shows on Netflix. The variety of audiences, purposes, and genres that we explore in these various classes continues to astound me. The lived realities and experiences that these students bring with them and those that they are preparing for make these classes dynamic and exciting to teach. To begin the year, there have been several events. After new faculty orientation, Wade came down and attended the President's Dinner with me. We also had a meeting to welcome back the majors, and that was fun to get to meet them. Getting reacquainted with Olivet's campus and culture has been somewhat odd, sometimes disappointing, but mostly exciting. 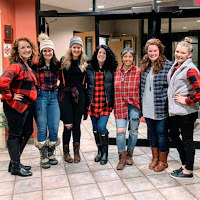 I think administrators and teachers really do try to do the best they can, but I think the most refreshing part about being back at Olivet is the students. They are smart, motivated, and open. They interrogate assignments, issues, and theories with respect and an awareness of the world around them that I don't think was as tangible when I was as student. It makes interacting with them very rewarding and engaging. The ONU English department this year is focusing on the theme: "Voice: Finding Yours, Celebrating Others." I really like this theme because it takes both individual and communal experience into account. It asks students to reflect on what it is they know, how they know, and what they want to learn in the future. In all the arguments for a liberal arts education, I think the recognition of the value of voice and experience has to be one of the most crucial to recognize. I'm glad to be in a department that values that as well. 1) My friend, support, and writing group member, Casie Moreland, defended her thesis at Arizona State University on Wednesday, August 29th, 2018 and became DR. CASIE MORELAND. I FaceTimed into just the very first part of her defense, and even what I heard in that short snippet was so, so smart, well put together, and engaging. I'm so proud of her hard work and dedication! 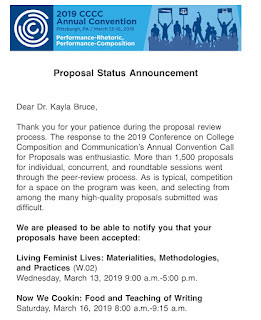 2) On that very same day, also the day I started classes, I got an email with an acceptance for two items for the 2019 Conference on College Composition and Communication. I've been to several Cs conferences, and I was so glad to be invited back to this one. The conference is in Pittsburgh, PA this year, and I'm really looking forward to presenting my own work on a panel presentation as well as serving as a committee member for a feminist workshop. 3) My yittle sister stick turned 28! We are now only one year apart which means that my thirtieth birthday must be just right around the corner. I was actually pretty sick from catching the ONU Virus of 2018 that ran rampant across campus about week three, but we went out for a delicious dinner of mussels and frites at Sardine in Madison and celebrated her birthday. 4) This summer I was invited to participate in an event at my MA institution, Illinois State University. As a theoretical framework, the ISU WPA, Dr. Joyce Walker, has championed the pedagogical use of Cultural Historical Activity Theory in the Writing Program. The event in November is a CHAT Retrospective on how alumni from the program have used the theory since leaving ISU. I will be presenting and reconnecting with friends, and I'm looking forward to it! One of my favorite parts of this past week was how I opened class. I know it can be tricky to be just a few days before a break but still at school. Inspired by The Good Place: The Podcast, I asked my students at the beginning of every class: "What's good?" I told them what was good in my life was that my puppy, Finley, turned seven this week. Since we first brought him home to Bourbonnais, I was glad to celebrate his birthday there as well. My students responded with wonderful responses. Things like, good sleep, boxed water, times with missed family and friends, engagements, and live music. Let's all remember to take the time to celebrate what's good.